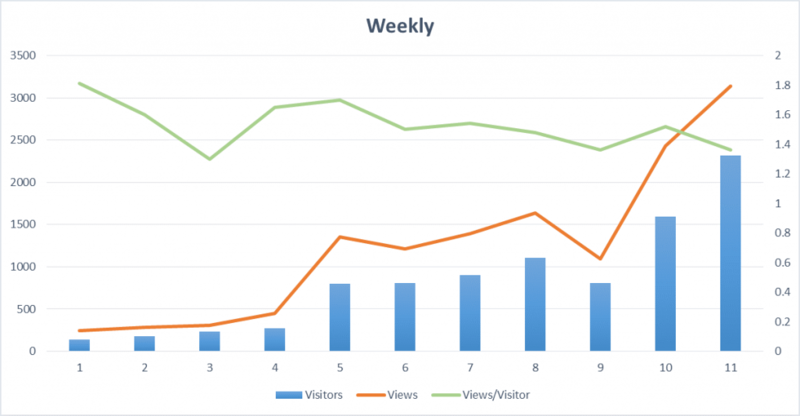 This is a weekly view of how our traffic progressed in the first 11 weeks. A couple of important things to note, look at how slow our traffic was in the first 4 weeks! Do not be discouraged! Building traffic on a website is a slow grind, but there are many strategies you can implement early that you will benefit from greatly in the long-run. Here are our strategies for the early game, right when your website is brand new. If you followed our initial guide on Getting Started and you’re hosted on WordPress.com, then take advantage of the WordPress Reader. There is a huge community of fellow beauty bloggers that you can put your articles in front of, but here are some important things to keep in mind. Actionable Titles – Make sure your title compels people to actually click! Make it interesting! Interesting Pictures – Important to make sure your featured image is a great one because that’s the picture that will appear in the reader. Get Involved – Follow other blogs, like their articles, comment, etc. Many bloggers will follow back, and check out your articles if you do so on theirs. You’ll notice when you post articles with proper tags that your articles will start getting comments, there’s a reason they do this! If you’re completely new to running a website, well then you have some studying to do. Search Engine Optimization is the name of the game. This is how you get your articles to rank well on Google so that your review shows up when people search for that product! There are so many great free resources on this topic, I’ll list a bunch of them below. You may need to click around a bit on their sites but they have tons of free articles that teach the details of SEO. Learn these principles, incorporate them early, and be consistent! Pretty much self evident, but some social media platforms don’t pay off as much as others. Pinterest – For us the biggest draw of traffic. Pin often, follow people, get involved, and grow your presence there. Make sure to post high quality pictures and many of the SEO principles apply to the pins as well (since Pinterest is essentially a search engine as well). Instagram – really doesn’t pull any traffic, very few people click the link in the bio (at least for us) so as far as growing traffic goes, instagram kinda stinks. Facebook – Fb is great for being sticky, as in your readers will come back if they follow your blogs facebook page. Oh we didn’t mention making a facebook page? Well definitely make one.. Now. Google+ – Not really worth sharing your articles to the Google+ communities, draws very little traffic. Twitter – I’ll be honest, we are not great about twitter. We don’t use it personally, but we have seen a small amount of traffic come there so it may become a bigger focus for us in the future. On top of everything written above is the obvious, WRITE CONSISTENTLY GOOD CONTENT. If you don’t create good content then building an audience is going to be quite hard. Remember, growing a website is a slow process, very few people can strike it big early, but consistent effort can get you there over time. Leave any questions or comments below! Really interesting post Ken. This was my job for many years, stretching back when “pay per click (PPC)” was THE way to get traffic. I think the best thing you two are doing is creating dynamic content, and in SEO, Social Media is Queen to Content’s King. The amount you both churn out and upload to so many platforms (IG please!!) is fantastic. As are Shannon’s videos. You’re going to make this happen if you don’t burn out. Keep up this pace and this time next year, you won’t even have time to say Hi! to me 😂.